During the day, the terrorists made 66 attacks in Donbas. 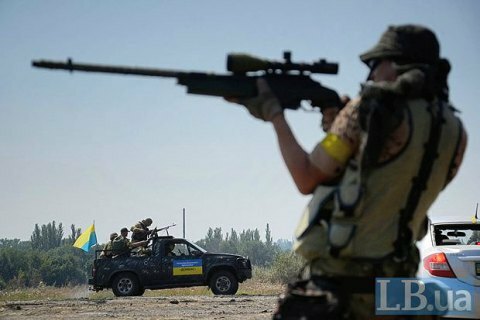 The militants continue shelling the positions of Ukrainian army in the zone of the antiterrorist operation in Donbass. The Russia-backed militants made 66 attacks last day, the ATO press center reported on 22 July. In the Donetsk sector, the militants launched 30 attacks, Avdiyivka being the tensest spot. The enemy used 120- and 82-mm mortars, rocket-propelled grenades to shell the positions of ATO troops, fired heavy machine guns and small arms. Novoselivka-2 was shelled from 120 and 82 mm mortars/ The strongholds in the Mayorske Verhnyotoretske, Opytne and Pisky were shelled from 82-mm mortars, in Luhanske and Nevelske – by propelled grenades, heavy machine guns and small arms. In the Mariupol sector, the terrorists 26 times opened fire at the ATO positions. Also in the evening of July 21, a group of 10 enemy saboteurs made an attack at Ukrainian strongholds in Marinka. Having received a proper rebuff, the separatists retreated in panic. The enemy used the 120 mm mortars and rocket-propelled grenades near Shyrokyno, 82 mm mortars and grenade launchers in Krasnohorovka and Mariyinka, heavy machine guns - in Vodyane and Novohryhorivka. Ten attacks were recorded in the Luhansk sector. The terrorist fired 82-mm mortars and rocket-propelled grenades, heavy machine guns, and small arms in the area of the village of Syze. The enemy randomly fired outside Novozvanivka, Novoaleksandrivka and Popasna. Last day, Ukrainian troops reported no fatalities, but five soldiers were wounded.